How might we help cohabiting, millennial couples save up for shared trips by encouraging them to improve home cooking habits? In order to design an effective solution, we conducted foundational research on behavior change and game / gamification theories. This timeline shows my team’s expansive research into several different topics throughout the project. We examined the concepts of self-efficacy and co-motivation as important factors of behavior change in people. Specifically, our interest in co-motivation piqued our interest in examining how interdependence can reorient motivation and promote positive behavior change in a couple dynamic (our target audience). 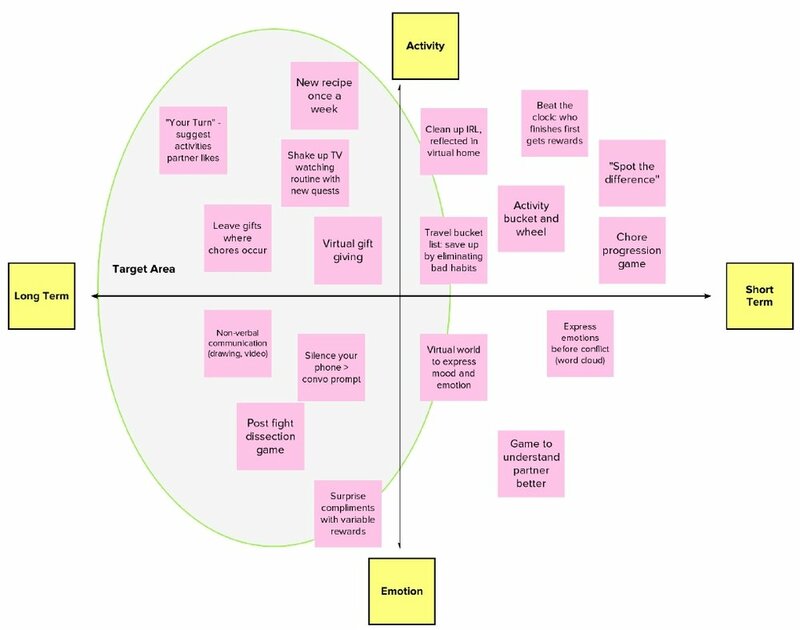 We found that the MDA Framework and Werbach's Game Elements Pyramid and Gamification Implementation process very informative in the game design of our app. We aimed to design a gamified app that is both educational and motivational for our target audience. This romantic relationships mind map helped us understand the various areas and aspects of the couple dynamic. Both Communication and Activities branches gave us inspiration moving forward. We brainstormed 51 ideas to help cohabitating couples enhance the quality time they spend together through a shared experience. We then did an "insight sort" and grouped the 51 concepts into 11 categories based on an agreed-upon clustering logic. These 11 themes helped us understand how our concepts shared similarities or exhibited differences. 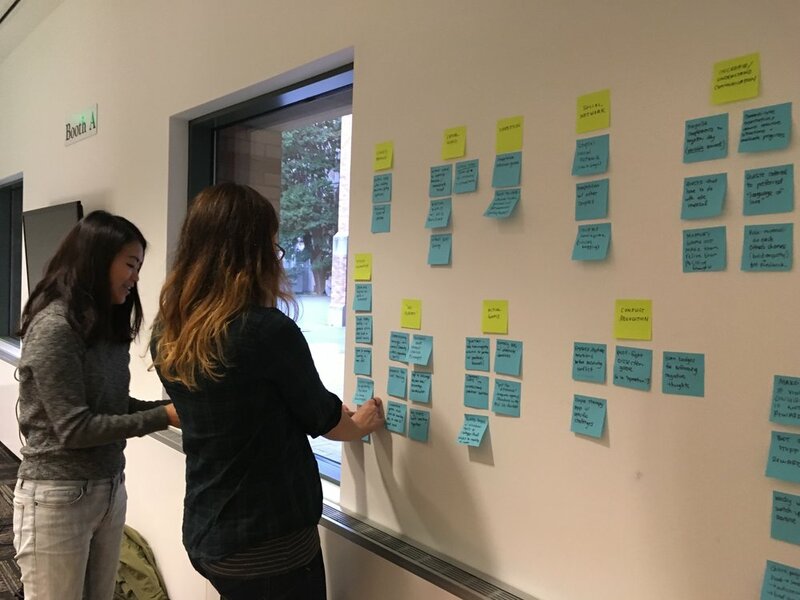 After combing through all 51 concepts and evaluating whether or not they actually targeted a behavior change, we were able to narrow them down to 18 concepts to plot on a 2x2 matrix to help us discover what qualities we would like our app to have. We preferred to design an app that targeted long-term engagement in our users. We decided to move forward with the concept “Our Bucket List,” later renamed to Piggyback. This concept appealed to us because it seemed the most feasible, viable, and desirable idea out of the three. Storyboarding assisted us in better understanding how our idea might work in front of real users. The highlighted frame emphasizes the joint experience of couples cooking at home to save together. This venn diagram was created to help us analyze the difference between our solution and a well-known financial app, Mint. The biggest difference is that our app focuses on cooperation and teamwork between the couple (our user) to foster a shared experience. Additionally, we scoped the app to focus specifically on the cooking (activity) and travel (goal/reward). At first, we wanted to create a robust app that featured many gamified features, such as quests, challenges, and goals. In order to create a stronger, focused MVP app experience, we scoped down to two instead of three tiers of gamified elements. Piggyback helps couples save up for trips through completing cook-at-home challenges. As part of the onboarding process, the user will send her partner an invitation to join her in the app. Piggyback is designed for a couple and the interaction between the two users is a key aspect of the app experience. Setting up the goal is a key part of the app experience. One partner can create a goal and share it with her significant other. Once the goal has been customized and agreed with both people, the couple can monitor their progress. Couples can take on weekly cook-at-home challenges to help them save up. The challenges encourage them to spend less money eating out and learn or improve a skill together as a team. Upon completing the challenge, the couple can deposit money into a virtual piggy bank. After making their deposit, the couple is asked to complete a reflection on how they did. This encourages couples to be communicating to each other about their progress and financial planning. Finally, travel-related awards are available after each successful challenge. Participants enjoyed gamification design and thought app would be fun to use. Visual design was engaging and inviting. Couples envisioned using the app to cook more frequently. 1) Participants wanted more flexible goals and challenges. Some participants wanted the ability to save for other goals beyond just trips/travel, especially since trips are usually expensive to save up for. Some participants wanted the ability to create their own cooking challenges or be able to cook with recipe suggestions from the app. Additionally, participants also wondered if challenges could be generalized beyond food and cooking. 2) Participants wanted to see how they are saving over time and a better way to benchmark their progress with savings. It was unclear to some participants how the challenges contributed to savings, especially since savings are self-reported. One couple mentioned that they would be more interested to use the app if there was a way for the app to keep track of their finances through their bank account. Additionally, participants wanted to see their improvement with savings over time. 3) Couples were not convinced that the app would help or facilitate improved communication. Although participants liked the social aspect of both partners working towards a goal, there was concern about how couples would use the app to work together. For example, one couple was concerned that the app would cause conflict in the relationship if one partner was more actively making decisions on the app than the other. Additionally, couples felt that communication and collaboration is hindered by the fact that each partner has to use their own phone to agree to decisions, even when they are in close proximity and are able to discuss their decisions in person. “It doesn’t mean a whole lot for couples to be in close proximity; it doesn’t really mean you’re productive,” says one participant. Integration with Mint, expanding beyond just food, cooking, and travel, as well as offering bigger rewards (e.g., cash back or real cash towards travel purchases) are a few ways that were considered during the making of this concept and would make the product more viable. There are many avenues for expansion and growth for Piggyback. Based on the feedback from participants during concept evaluation, customization, tangible rewards, and comprehensive financial tracking are features that couples desired. How do we know if this product will be successful or not? Although this conceptual project did not focus on business goals or considerations, I thought of some ways to measure success for Piggyback, should it be developed in the future. One way to identify if the app is successful or not would be to ask users how likely they would recommend Piggyback to their friends. If Piggyback is fun and addictive to use, it can be adopted through word of mouth. If users enjoy the gamification aspect of Piggyback and the content of the productive remains fresh and relevant, Piggyback can become successful in the long term when users continue to stay active on the app. 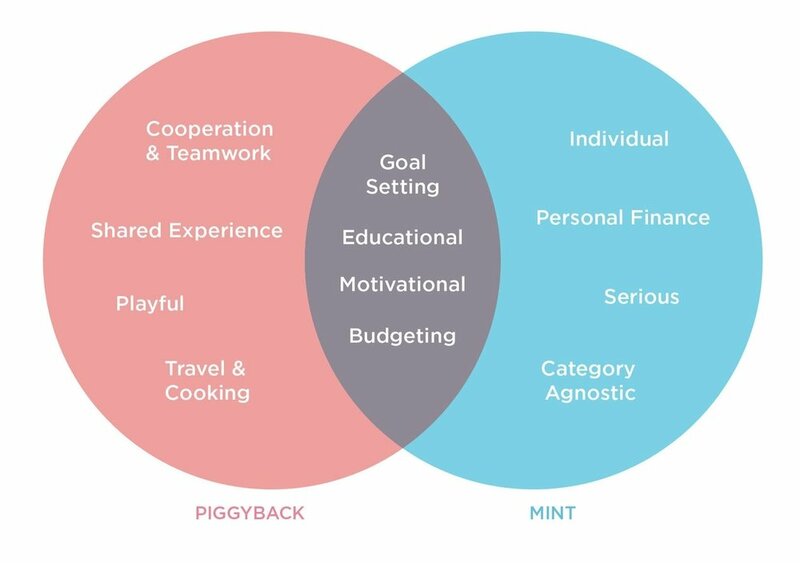 If Piggyback does partner with companies (e.g., airlines and travel companies) to provide savings incentives as well as integrate with Mint, revenue from those partnerships can also contribute to the success of the product.